In the heart of what was once the bustling core of Columbus' warehouse district stands one of the city's most shining examples of historic renovation. Today, The Lofts Hotel anchors a thriving contemporary commerce center. Built in 1882, The Lofts' spectacular form and function mirrors its grand past. Exposed brick, wood beams and duct work add style while they whisper a reminder of The Lofts' history. Sparkling floor-to-ceiling windows offer dramatic views, allowing you to feel the pulse of the city -- vibrant and alive. 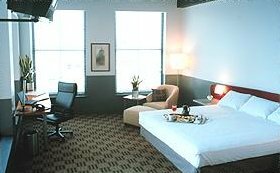 Soaring 12-foot ceilings and tasteful refinements create an ambiance unlike that found in any other Columbus hotel. We leave no creature comfort to chance. From linens so rich they seem to caress to exquisite Italian leather sofas that beg to be touched, The Lofts make even the most discriminating guest feel at home. Whether its business or pleasure, sophisticated travelers know what they want. We know too. Find what you want in The Lofts. This and other Columbus Ohio Hotel can be found here in The Register.